This petition has been created by Zack C. and may not represent the views of the Avaaz community. The Xenosaga trilogy is one which has impacted and excited well over a million fans. With Katsuhiro Harada calling on fans to show Bandai Namco our desire for an HD remaster of the series via Twitter (be sure to Tweet him @Harada_TEKKEN), Operation KOS-MOS was established to rally and organize support while further spreading the message so that more people know what is at stake. As Harada pointed out, the point is to get as many individuals as possible to pledge to buy, rather than just a few really dedicated fans. First released on 28 February 2002 in Japan and nearly a year later in the United States, Xenosaga Episode I: Der Wille zur Macht started something wonderful that would be concluded 6 July 2006 in Japan and 29 August that same year in the US. The series was and remains popular across the globe. Unfortunately, that globe was partially shattered with the original Xenosaga trilogy release pattern, with only Xenosaga Episode II: Jenseits von Gut und Böse ever making it to Europe. This made many fans disappointed and confused a decade ago. While fans remain upset over this fact, it only further reinforces why there is a large audience prepared to buy the Xenosaga trilogy in HD. The opportunity to rectify this past issue sits right before us. In short, this petition exists to help send Katushiro Harada the message that there is indeed a wealth of fans waiting to support the Xenosaga trilogy again, this time fully remastered and globally available. Thank you for your support and for your time! 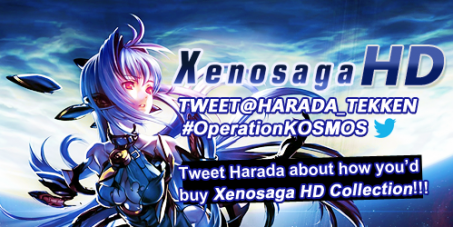 Please use the #OperationKOSMOS hashtag, as well. We are looking for translators to help release this petition in more languages! If you are fluent in any languages other than English and could take on the task, please email [email protected] Thank you.